In the fast-changing world of work, acquiring Blockchain skills is the smartest career move. The course gives you the professional orientation to Blockchain technologies and Blockchain Application development that you need as an Oracle developer in today’s changing world. You’ll Understand the basics of Blockchain, and Hyperledger Fabric Project, and how these form the basis of the architecture of Oracle Blockchain Cloud Service. Further dive into understanding the components of Blockchain, the Transaction Flow Model, and the Oracle Blockchain Cloud Service console. Here also learn to setup a Blockchain, monitor the network, explain related network activities, and explain different types of nodes and their characteristics. Certification: This course will assist in preparation for the Oracle Blockchain Cloud Boot Camp: certification exams. This course introduces students to the fundamentals of Oracle Blockchain Cloud Platform technology. In this course students learn the concepts of relational databases and the powerful PL/SQL programming language. This course will assist in preparation for the Oracle Blockchain Cloud Platform: Certification exams. This Blockchain Essentials for Database Developers is designed for Database developers, Administrators, Modellers and Architects who need to make decisions about generic blockchain architecture such as Etheruem, Hyperledger Fabric, Qora and Commercial blockchain Platforms such as IBM, Microsoft and Oracle blockchain Platforms, architecture, environment and development platforms. Certification: This course will assist in preparation for the Blockchain Training Alliance Certification Examinations. 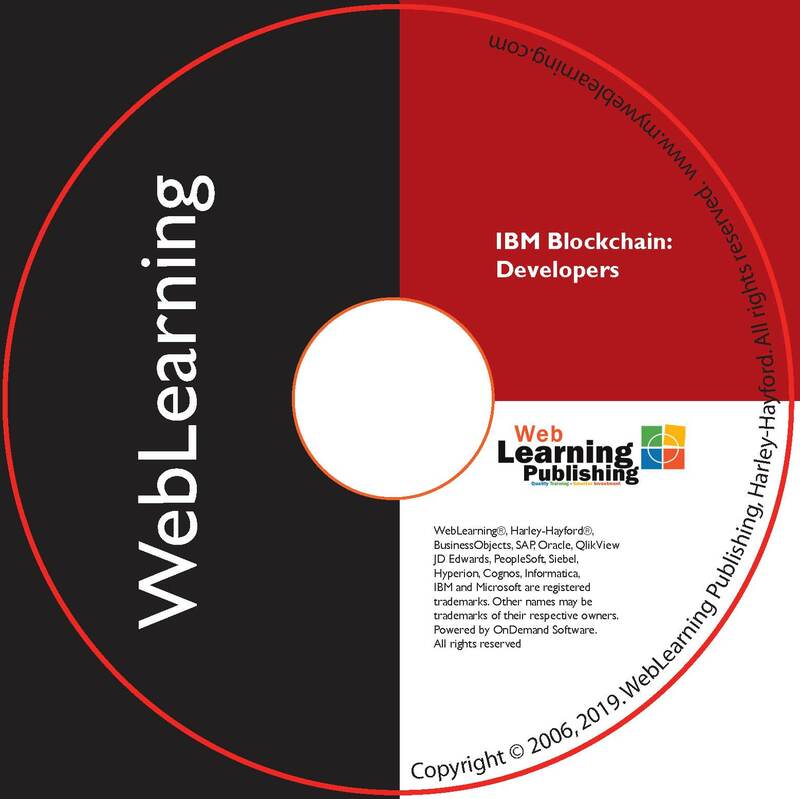 The IBM Blockchain for Developers course will teach students how to install and maintain an IBM Blockchain for Developers, how to create an operational database and properly manage the various structures in an effective and efficient manner including performance monitoring, database security, user management, and backup/recovery techniques. This course provides a detailed overview of Hyperledger Fabric, Composer, Permissioned and Permissionless blockchains, smart contracts, Chain code and the development language, Go and is designed for those seeking an in-depth understanding and development experience of the Hyperledger Fabric Blockchain platform. The IBM Blockchain for Business course is designed for non-technical professionals who want a high level understanding of various Blockchain technologies including Ethereum, Corda, Quorum, Hyperledger Fabric and Hyperledger Composer blockchain business networks. The Hyperledger Fabric Blockchain for Business course is designed for non-technical professionals who want a high level fundamentals view on developing Hyperledger Fabric and Hyperledger Composer blockchain business networks. The Hyperledger Fabric Blockchain Development course is designed for developers and administrators who want a high level fundamentals view on developing Hyperledger Fabric and Hyperledger Composer blockchain business networks. The Ethereum Blockchain for Business course is designed for non-technical professionals who want a high level view of the Ethereum blockchain platform and related technologies from a business perspective. This course provides a high level overview of Ethereum, smart contracts, and the development language, Solidity and is designed for those seeking an in-depth understanding and development experience of the Ethereum Blockchain platform. This course provides detailed end-to-end view of Ethereum, smart contracts, and the development language, Solidity and is designed for those seeking an in-depth understanding and development experience of the Ethereum Blockchain platform. This course provides a detailed overview of Ethereum blockchain platform, smart contracts, and other commercial and open source blockchain platforms including IBM, Oracle, Microsoft and the open source Hyperledger blockchain platform. This course is designed for technical and non-technical professionals seeking an in-depth understanding of the Ethereum and business Blockchain platforms. The course covers basic properties of bitcoin, the mechanics behind it, including cryptographic hash functions, Bitcoin Script, privacy, and hash commitment schemes. In-depth understanding of Bitcoin from the ground up, including - Identity, Transactions, Record Keeping, and Consensus. The revolutionary significance of Bitcoin as opposed to some of its early predecessors. Bitcoin Script, privacy, and hash commitment schemes. Certification: This course will assist in preparation for the Blockchain Training Alliance Certification Examinations.. The course covers many key topics in the blockchain Technology space. First, we take a look at distributed systems and alternative consensus mechanisms, as well as cryptoeconomic and proof-of-stake. We then move on to the fundamental applications of bitcoin and blockchain technology, including exploring enterprise blockchain implementations (JP Morgan’s Quorum, Ripple, Tendermint, and HyperLedger), the challenges and solutions around scaling blockchain adoption, and the measures that the government is taking to regulate and control blockchain technology. This course covers all known aspects of Corda Blockchain Distributed Ledger Architecture that exists in a production environment today. This course provides a detailed overview of Cryptography, Distributed Ledger, Blockchain Platforms, Blockchain Consensus, Blockchain Immutability, Blockchain Trust, R3 Corda vs Bitcoin and Ethereum, R3 Corda vs Hyperledger, Corda Peer-to-Peer Network, Distributed Ledgers and the UTXO Model. The course gives you the professional orientation to Decentralised Blockchain Apps that you need as an Oracle developer in today’s changing world. It covers key features of blockchain technologies and the differentiators between various types of Blockchain technologies and platforms with emphasis on Hyperledger projects. This course provides high level overview Blockchain technologies and its uses in business. Blockchain platforms discussed include Ethereum, Hyperledger Fabric, Qora; how they relate to the Microsoft Azure Blockchain platform and concepts such as smart contracts. The course is designed for technical and non-technical professionals seeking an in-depth understanding of the Microsoft Azure Blockchain platform. This is an introductory course on Blockchain technologies and its uses in industry within the context Microsoft Azure Blockchain platform and services. Blockchain platforms discussed include Ethereum, Hyperledger Fabric, Qora; how they relate to the Microsoft Azure Blockchain platform and concepts such as smart contracts. The course is designed for technical and non-technical professionals seeking an in-depth understanding of the Microsoft Azure Blockchain platform. This course provides a technical overview of Microsoft Azure Blockchain platform inluding Ethereum, Hyperledger Fabric, Qora, smart contracts, the Ethereum development language-Solidity, the Hyperledger chaincode development language-GO, Node.js and Angular.js; and is designed for technical and non-technical professionals seeking an in-depth understanding of the Microsoft Azure Blockchain platform. Blockchain can be used to make Finance and Banking more transparent and accessible and empower investors, clients, manufacturers, creditors, debtors, auditors and stock exchanges to take control of financial and management accounting, reporting and auditing process. This course will get employees equipped with the knowledge to blast their companies into the 21st century, will give entrepreneurs the cutting edge, and most importantly, will empower financial professionals and their stakeholders to be in control of their financial and banking processes and improve overall provider satisfaction. Blockchain can be used to make Supply chain and trade Finance more transparent and accessible and empower investors, clients, manufacturers, creditors, debtors, auditors and stock exchanges to take control of financial and management accounting, reporting and auditing process. This course will get employees equipped with the knowledge to blast their companies into the 21st century, will give entrepreneurs the cutting edge, and most importantly, will empower financial professionals and their stakeholders to be in control of their financial and banking processes and improve overall provider satisfaction.